This diagram was created by Randal in Adobe Illustrator as vector art for an engineering client who manufactures prefabricated vertical drain remediation systems. It has a cutaway section showing how the system looks and works below ground, as well as how it is laid out above ground. 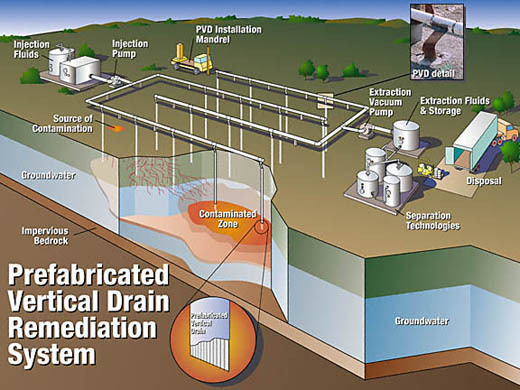 These systems help prevent groundwater contamination, as well as help clean up contamination when it does occur. Unlike bitmapped or “raster art,” vector art can be scaled to any size without losing any resolution.